In this episode, we head to Houston, Texas, USA to talk to the three members of the NIGERIAN WOMEN'S BOBSLED TEAM, Seun Adigun, Ngozi Onwumere, and Akuoma Omeoga, who are currently crowdfunding on GoFundMe to raise funds for training and competition costs as they aim for the 2018 Winter Olympics in Pyeongchang. To date, there have been 7 athletes from the continent of Africa who have competed in the Winter Olympics. None of them have competed in Bobsled, and none of them have been women. 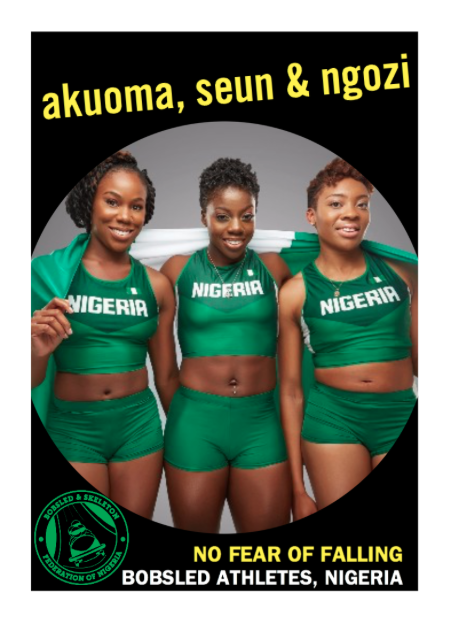 So these three are breaking new ground in their journey, and in turn inspiring a generation of athletes in Nigeria and Africa to look outside the normal, and to aim to do something different. But not only are they breaking new ground, they are doing it in a DIY fashion; to the point of making their own training equipment, conducting their own social media, and combining the training schedules of an Olympic athlete within their own lives which already have higher educational studies and careers within them. Their journey so far has been documented by a number of different media outlets, both in print, television, and on the internet. For some, this exposure would go to their heads, but these three continue to maintain that what they are doing is so much bigger than just them, and have stayed humble and selfless within it all. We talked about their journey so far, the nuances associated with learning Bobsled, the impact that they hope to leave in their continent through what they are doing, and how failure is a way to learn, grow, and develop yourselves into a stronger person.